When Richard Linklater is on, I can sit in front of the screen with a big old dumb smile on my face. The Cap'n has had a somewhat scattered relationship with the Austin, Texas auteur's filmography: there are movies of his I absolutely go nuts for (A Scanner Darkly), and ones I grow to appreciate with every passing year (Dazed and Confused), but there are also the ones that I just cannot stand (Slacker, Waking Life), ponderous exercises on philosophy that you'd hear in a haze of bong smoke in freshman dormitories (not that I'd know anything about that, obviously). When I say "cannot stand," I mean that I've tried to watch Waking Life and Slacker again and I usually turn them off, because the only thing I think following one interminable monologue after another is "so what?" It's somebody's cup of tea, but not mine. There are also the movies he makes where I can't quite wrap my head around the fact that Richard Linklater made that, like The Newton Boys, School of Rock, Fast Food Nation, or Bad News Bears. I guess it's kind of a "one for them, one for me" situation that I often equate with Steven Soderbergh, but reconciling that the guy who made Tape or who spend twelve years making a movie (Boyhood, coming out later in 2014) also made a movie about kids rocking out with Jack Black boggles the mind sometimes. If there's one universal exception to my "will I like this Linklater joint or not" rule, it's the "Before" triptych: Before Sunrise, Before Sunset, and now Before Midnight. The series is a sort of accidental experiment: nine years after Before Sunrise, Linklater, Ethan Hawke, and Julie Delpy found themselves wondering where Jesse (Hawke) and Celine (Delpy) were in their lives, and what happened after they parted ways. Did they meet up, like they promised to? Did one of them show up, but not the other? The result, Before Sunset, was a sequel that was even better than the first film, where youthful optimism was weighed down with the reality of adulthood. Jesse and Celine spent an afternoon in Paris, just talking, and at the end, another question lingered: as Celine dances to Josephine Baker while Jesse watches, would he catch his plane back home or not? 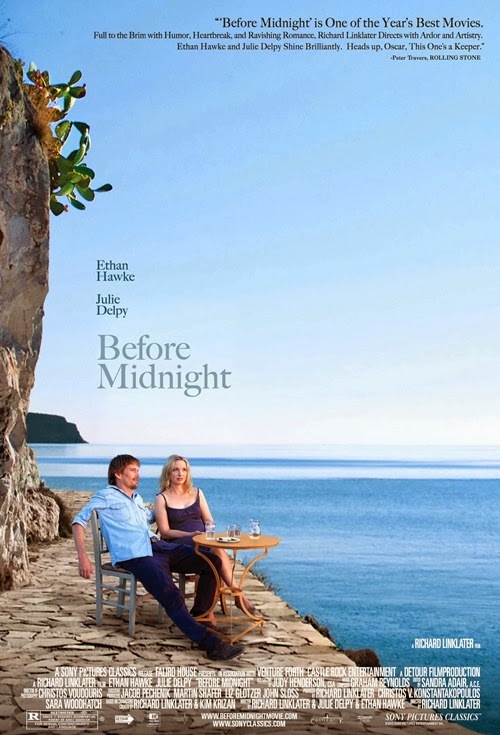 Before Midnight, set (and made) nine years after Sunset and eighteen years after Sunrise, doesn't wait long to answer that question, or to present the ramifications of Jesse's decision. He's dropping his son Hank (Seamus Davey-Fitzpatrick) off at the airport in Greece. After a summer vacation, it's time for Hank to go back home to his mother, Jesse's ex-wife, in Chicago, while Jesse, Celine, and their twin girls Ella and Nina (Jennifer and Charlotte Prior) enjoy a few more days in Messinia. They've been staying at the home of Patrick (Walter Lassally), a writer and friend of Jesse's, and some of his friends, for good conversation, but lingering and unresolved issues about Hank, Celine's career, and the vacation itself bubble up as the day wears on. What's so fascinating about revisiting these characters after nearly twenty years is the sense of immediate familiarity with them, of knowing their history and being able to jump right back into their lives without needing to be reintroduced. I'm not sure how Before Midnight would play for someone who hadn't seen Before Sunrise and Before Sunset, but I have to imagine much of the appeal to the film is being able to come back to their relationship further along in time. And Linklater, Delpy, and Hawke make a very interesting decision with the third film: instead of taking a snapshot of the two of them connecting or reconnecting, Before Midnight is about the reality of them staying together and being in a long term relationship. We aren't seeing them together for the first time or navigating crossing paths again, but instead seeing them living their lives together after nine years. It's a different experience, but wholly rewarding. The film is broken into what amounts to six scenes, six conversations, each building towards the last thirty minutes, where resentment and unspoken demands boil over in a hotel room. We see the foundation of the argument building in the car ride from the airport, at Patrick's house, during the walk to the hotel, and in the lobby, and the way that Jesse and Celine use their history against one another. It's a slow build, where slights go ignored first, but are later held for use to really hurt someone's feelings, to dispute the idea that someone is "winning" this fight. It never feels artificial, never scripted: their conversation flows like two people talking, picking up on half finished thoughts and running with them throughout the film, holding on to them for later. And in the background, we as an audience can feel their history, can relate to it, because we've been there with them, even if it wasn't the entire time. Jesse and Celine lived on in our imaginations, so when we pick up with them in their 40s, we bring along everything we hope they did or saw since the last time we saw them. It's a unique opportunity for Linklater to explore a relationship onscreen over time, where the audience fills in the ellipses. It wouldn't work if Before Midnight didn't have something compelling to add, and it does, but it's nevertheless impressive that a fictional relationship continues to have such resonance. Hawke and Delpy slip back into the roles effortlessly. Yes, they're both older, and life has changed in many ways since Paris of 2004, but who they are is still there. Things are just more complicated, and they've had nearly a decade of being together, of being parents, of navigating a divorce and custody and trans-continental families to contend with, and there are strains. They might be growing apart, and it's scary. All of this comes out organically through their conversations, often presented in long takes with just Delpy and Hawke on camera. The hotel scene could be a one act play, and a potent one at that. The coda, following the argument, is ambiguous in a way that surpasses either of the first two films. Depending on how you choose to read it, it could be sad but hopeful or be the last light in the face of resignation. To credit the three of them (who co-wrote the screenplay), it's up to us to decide.